Am I Having A Spiritual Awakening? So this is basically what my twitter feed looks like right now. I've expressed myself on snapchat since I feel more relaxed and comfortable on there. Nonetheless, yesterday someone contacted me and asked if I could please write about this on my blog since they were feeling the exact same way and wanted to know how to deal with it. I thought it was something risky to do since I've never opened up on a personal level here. 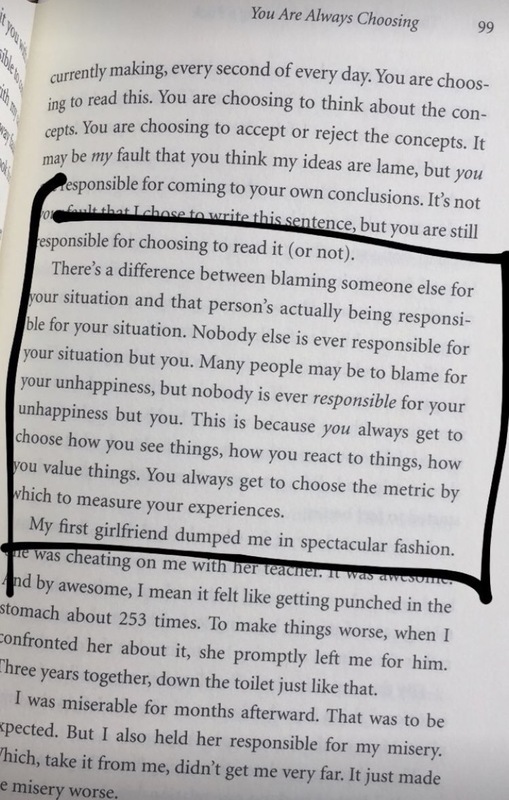 I'm hoping this post helps anyone who is going through a rough time right now. 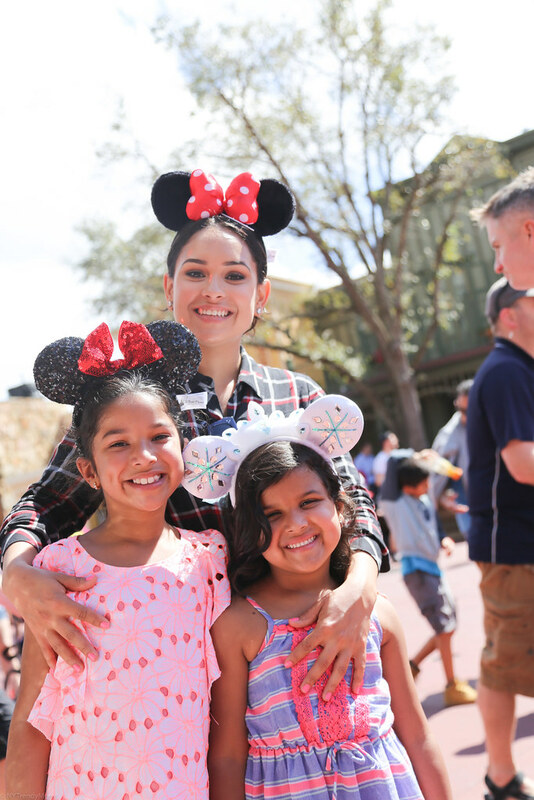 “I partnered with Disney to attend the #FamiliaDisney media trip and produce this post. As always all opinions are my own. 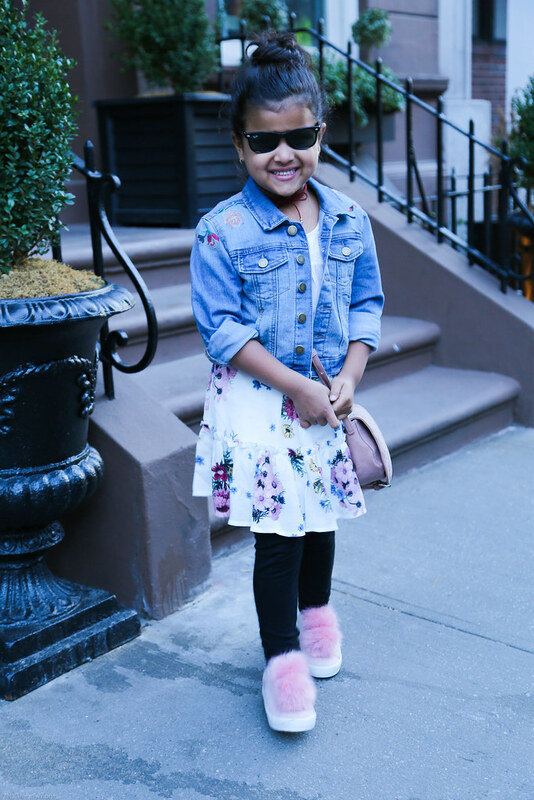 Thanks for supporting the brands and collaborations that make NY Trendy Moms possible!" I'm finally sharing all the details from my visit to Walt Disney World. As many of you know, this was my families very first time visiting this magical place. We did so many amazing things, I don't even know where to begin. How about from the very beginning? I planned the entire trip without my kiddos having any clue we were going. I secretly packed our bags and told them I had to unexpectedly go on a business trip and they had to drop me off at the airport, at 5am! Initially I was supposed to record the whole thing and post it on this article but everything went downhill when we arrived at the airport. They were cranky because they had only slept a few hours and didn't want to even get out of the car. I also brought along my nephew as it was my birthday gift to him. The plan was simple; I handed each one an envelope. They would open it one at a time. One said 'YOU', the other one said 'ARE' and the other one said 'GOING TO DISNEY WORLD'. As simple as it may have seemed (in my head) it didn't go well. I did record the entire thing but wont be sharing it since they didn't react like I expected them to. I mean, they were 100% happy yet confused at the same time. I would say more confused then anything else. Nonetheless, I will be saving these memories for years to come. All the magic began the minute we got off the plane in Orlando Airport and hopped on the Magical Express which took us straight to our resort. Our resort was the Art of Animation. If you're wondering; the Art of Animation resort's theme is Finding Nemo, Cars, The Lion King and The little Mermaid. Over the weekend my family and I visited a really fun restaurant called Medieval Times located in 149 Polito Ave, Lyndhurst, NJ 07071. This isn't your ordinary restaurant, this is a Medieval themed restaurant/tournament. Crazy right!? I had no idea something like this even existed and to think this location is one of 9 around the country. It was super simple to navigate to the NJ location and it was less than an hour away from New York City. If you're still confused as to what this is.. let me break it down. On the Medieval Times website you're able to pick from 3 ticket packages; King's Royalty package, Royalty package and Celebration package (visit their site for more details). With each ticket purchase you'll receive a 4 course meal and beverages. They have vegetarian meals available and accommodate any allergies. They also have alcoholic beverages available for purchase. The show lasts two hours and you'll see competing knights, beautiful horses, and so much more (I don't want to give it all away). All you have to basically know is that you're in for a treat. 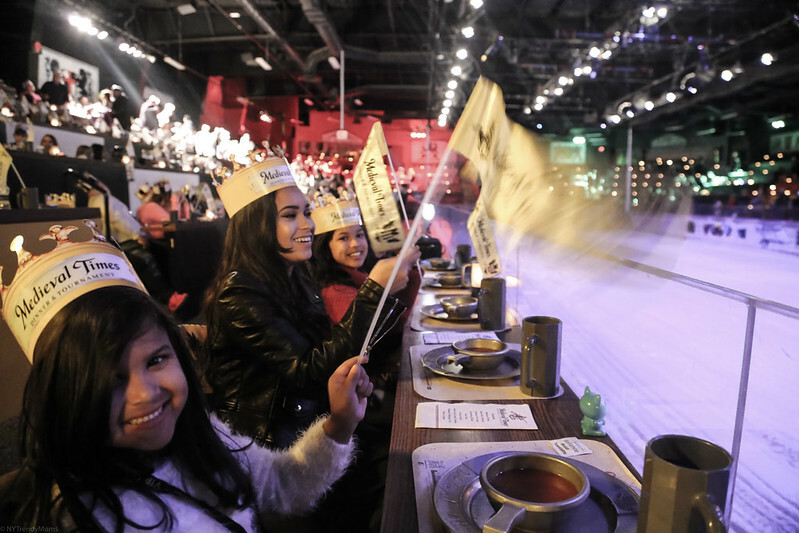 Right now Medieval Times is running a promotion; $38.95 for adults (original price $62.95) and $29.95 for kids under 12 years old (original price $36.95). This offer is only available through April 30th and will only be applied if you enter code SB17 during checkout. Durante el fin de semana mi familia y yo visitamos un restaurante muy divertido llamado Medieval Times ubicado en 149 Polito Ave, Lyndhurst, NJ 07071. Este no es su restaurante normal, este es un restaurante y torneo. Increíble no!? Yo no tenía idea de algo como esto existía y pensar que esta ubicación es una de las 9 en todo el país. Fue super sencillo navegar a la ubicación de NJ y estaba a menos de una hora de Nueva York. Si todavía estás confundida en cuanto a lo que es .. déjame describir. En el sitio web de Medieval Times puedes elegir entre 3 paquetes de tickets; el paquete de King's Royalty, el paquete de Royalty y el paquete de Celebración (visite el sitio web de Medieval Times para más detalles). Con cada compra de boletos recibirá una comida de 4 platos y bebidas. Tienen comidas vegetarianas disponibles y acomodan cualquier alergia. También tienen bebidas alcohólicas disponibles para comprar. El espectáculo dura dos horas y verás caballeros compitiendo, hermosos caballos, y mucho más (no quiero darlo todo). Todo lo que usted tiene que saber básicamente es que usted y su family van a está sorprendidos. Ahora Medieval Times tiene una promoción; $38.95 para adultos (precio original $62.95) y $29.95 para niños (precio original $36.95). Esta oferta sólo está disponible hasta el 30 de Abril y solo se aplicará si ingresa el código SB17 durante la compra. It's nearly impossible not to get excited when Target releases a new kids collection. Leanne and Zareena are always first in line to select fun pieces to add to their closet when new releases are announced. We were finally able to get our hands on a few pieces from the popular Art Class Collection. Today, Leanne is wearing the top, denim jacket, chocker set, bag and floral skirt from the Art Class Collection. We can all agree that as time passes by Target's new collections get better and better. & of course that makes my family so happy. Not only because the prices are so low but also because you don't have to sacrifice style or quality. When my daughters saw the items for the first time they loved nearly every piece. You probably already know they're very outspoken about their styles so when I told them to answer a few questions about their favorite pieces from the Art Class Collection they were thrilled. Be sure to read it here. Today is an exciting day for HSN’s Jean Queen, Diane Gilman, who is launching a brand new denim jacket collection. Since owning the perfect denim jacket is an absolute must-have for Spring I decided to style one of her pieces in a very popular way, Canadian tuxedo. I mean who doesn't love denim? I know my fabulous New York Trendy Moms do. The DG2 by Diane Gilman denim jackets launch LIVE on HSN as a “Today’s Special” show all-day today. The DG2 jackets are available at an amazing price ($44.95) and come in 7 colors and sizes (petite to plus). See more options here. I can't think of a better Spring essential than a denim jacket. They are perfect for layering casual or sporty chic looks. One thing that stood out for me was the soft stretchy material. I received a size small but since it's stretchy I would've loved an x-small for a tighter fit. So keep that in mind when ordering. Hoy es un día emocionante para la reina de mezclilla en HSN, Diane Gilman, está lanzando una nueva colección de chaqueta de mezclilla. Todos sabemos que las chaqueta de mezclilla son perfectas para la primavera así que decidí estilar una de las nuevas piezas en el look de hoy. Yo sé que a mis fabulosas mamas Neoyorquinas les encanta la mezclilla. Las chaquetas de mezclilla de Diane Gilman se lanzan en vivo hoy en HSN como un "Especial de Hoy" todo el día. Las chaquetas DG2 están disponibles a un precio asombroso ($ 44.95) y vienen en 7 colores y tamaños (pequeño a grandes). No puedo pensar en un mejor esencial para primavera que una chaqueta de mezclilla. Son perfectas para capas de moda casual o deportivo. Una cosa que se destacó para mí fue el material elástico suave. He recibido un tamaño pequeño, pero ya que es elástico que me hubiera encantado un x-small para un look más ajustado. Así que tenlo en cuenta al hacer el pedido. There's no denying that Spring is near for us New Yorkers. Some of us aren't even waiting for the warmer weather to start buying Spring pieces and I don't blame you. We've seen off-the-shoulder stick around for awhile and thankfully it's not going anywhere just yet. Spring is the perfect time to stack on those off-the-shoulder pieces, tops and dresses. 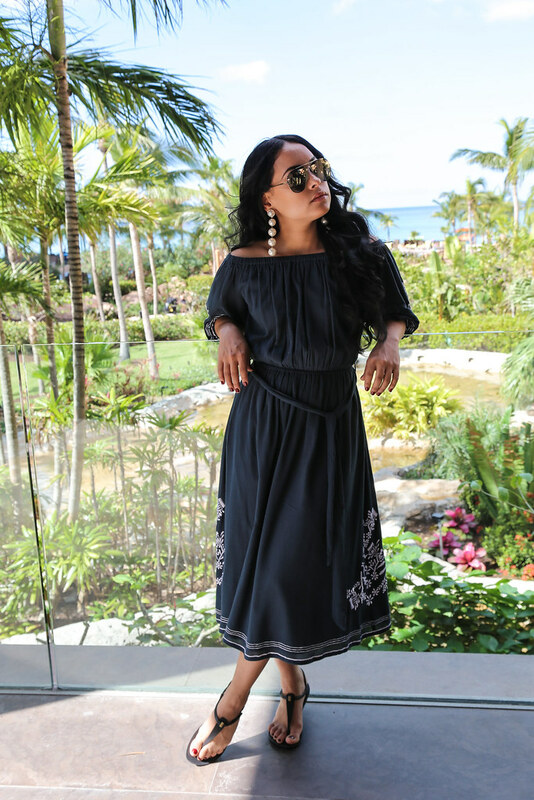 The piece I'm wearing today is by Tularosa. I wish I would've done a different pose so you could see the beautiful design on the sides of the dress. I shot this look minutes before swimming with the dolphins in the Bahamas last month and wanted to get a few shots before changing into my bathing suit. If you click on the link of the dress you'll be able to see more angles. Nonetheless, this dress turnout to be a great piece for 70-80 degree weather. It has a nice feminine touch with the side floral prints and the white stitching around the lower part of the dress. The best part is that you can dress it up with heels or down with sanders/sneakers. Accessorize till your heart's content. & enjoy the breeze on your shoulders and all around (inserts emoji with a wink). You cannot go to a tropical island and not wear Ipanema sandals. This black pair are just one of the 10 I own (not kidding). They are minimal and sooo comfortable! No se puede negar que la primavera está cerca para los Neoyorquinos. Algunos de nosotros ni siquiera estamos esperando el clima más cálido para empezar a comprar piezas de primavera y no las culpo. Hemos visto fuera la tendencia del hombro a fuera y, afortunadamente, no se va a ninguna parte todavía. Primavera es el momento perfecto para usar esas piezas fuera del hombro. La pieza que llevo hoy es de Tularosa. Ojalá hubiera hecho una pose diferente para que pudieran ver el hermoso diseño en los lados del vestido. Me tire estas fotos minutos antes de nadar con los delfines en las Bahamas el mes pasado y quería tomarme unas cuantas fotos rapiditas antes de cambiar a mi traje de baño. Si haces clic en el enlace del vestido podrás ver más ángulos. Este vestido tiene un toque femenino agradable con las impresiones florales laterales y la costura blanca alrededor de la parte inferior del vestido. La mejor parte es que se puede vestir con tacones o con zapatillas. Accesorios hasta el contenido de su corazón. Y disfrutar de la brisa en los hombros y todo alrededor (guiño). No se puede ir a una isla tropical y no usar sandalias de Ipanema. Este par negras son sólo una de las 10 que tengo (no bromeo). Son mínimas y tan cómodas!